Juliana does not enjoy getting up early for school. She is difficult to drag out of bed, she falls over while I get her dressed, and I never know what the drama will be each morning. On the first day of school she went back to sleep on the couch. This morning I got her dressed and she went into the bathroom. I went downstairs to finish packing her lunch and realized that she hadn’t come downstairs. She was back in her bed, snuggled under her blankets. Clothes, sweater, backpack, lunch – those are usually not an issue. The shoes bring the drama. She is used to wearing flip flops each day and any real shoes would be disappointing to her. But plain brown or black shoes are simply too much for her to handle many mornings. 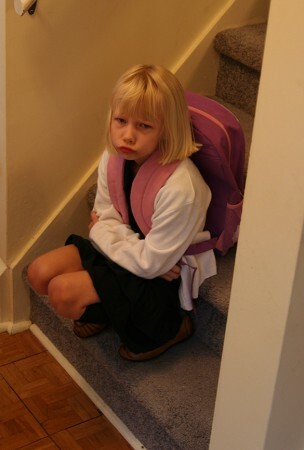 And out comes the pouty, mad at mommy face until it is time for the bus. When we see the bus coming she immediately cheers up. She asks me to please walk her to bus and takes my hand. We walk out to the street together and she bounces up the stairs of the bus, takes her seat, and heads off to school with a smile on her face.